The volume was printed by Henry Middleton for publisher John Harrison, who would go on to publish Venus and Adonis in 1593, introducing “William Shakespeare” with a narrative poem personally overseen by the author. 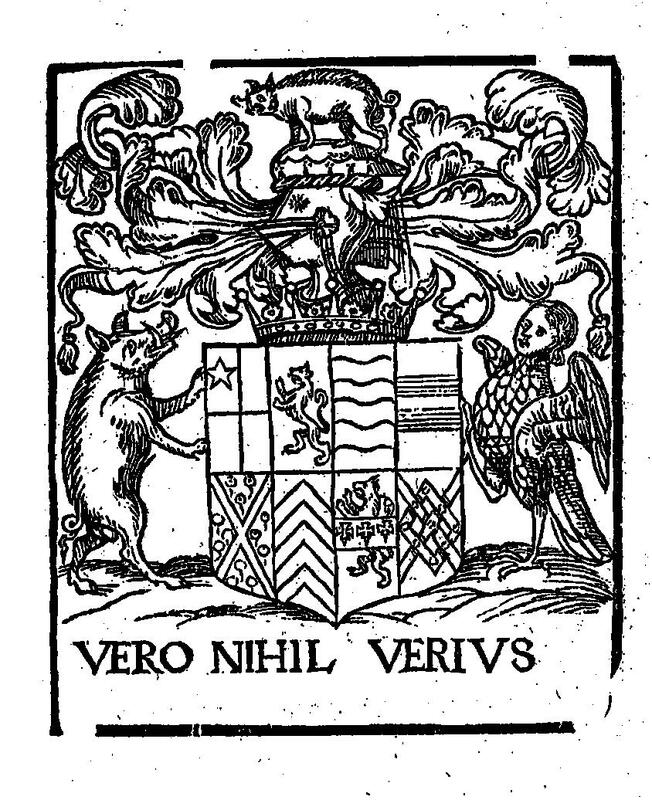 Immediately inside the book, on the first lefthand page, is the coat-of-arms usually used by Oxford, with his earldom motto VERO NIHIL VERIUS or Nothing Truer than Truth displayed along the bottom. 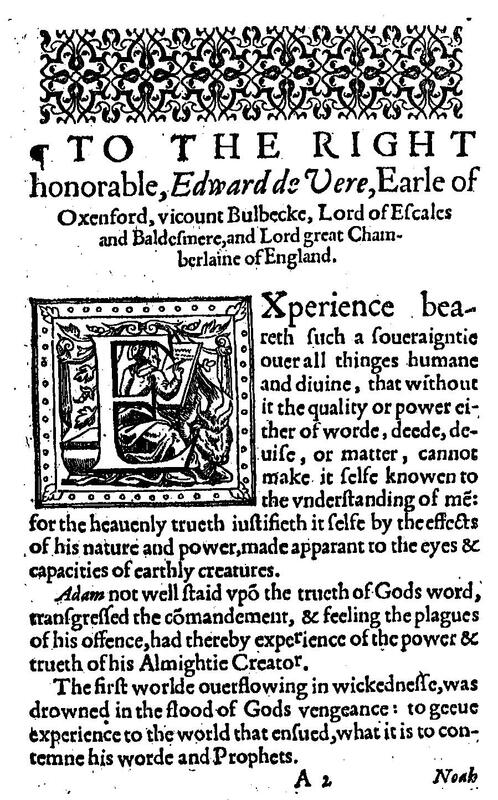 My feeling is that Edward de Vere not only acted as patron but financed the publication himself; and beyond that, I am sure he took great interest in this work and probably contributed a great deal to it behind the scenes. Edward Earl of Oxford was all of that … and much more. Hank, again a great work. However, as to the Hamlet, the more I read it the more I feel that in the character of Hamlet de Vere created a ‘mixture’ of himself and Southampton. Do you have this feeling, either? Hank, it would be great joy for me to hear/read that talk. Is it available in any form? I have to look in my files. I gave a talk on it that may not have been written out completely. But I can reconstruct a lot, especially regarding the final act of Hamlet Q2 1604. Laertes, brother of Ophelia, would become Robert Cecil, brother of Oxford’s wife Anne Cecil. Hamlet, now morphed into Southampton, begs Laertes-Cecil for “pardon” more than once in his speech that includes admitting that he shot the arrow o’er the house and hit my brother, that is, for leading the Essex rebellion, which was in fact aimed at getting rid of Robert Cecil. I’ll see what I can dig up and reconstruct, in upcoming weeks, and post it on the blog. I thought Richard Field published Venus and Adonis. Or is that he printed it? What would be the difference? Strats make a big deal of this because Field came from Stratford. The White Greyhound was the sign of the publisher and bookseller John Harrison (the Elder). I’m far from an expert in this matter, but if you follow the money, clearly any income must come first from the paying customer to Harrison the bookseller and then to Field, in each of these three cases. I’ll stop here, although there’s more to it, and it does seem that Field is commonly held to have been the “publisher” of the first edition of Venus and held the copyright. 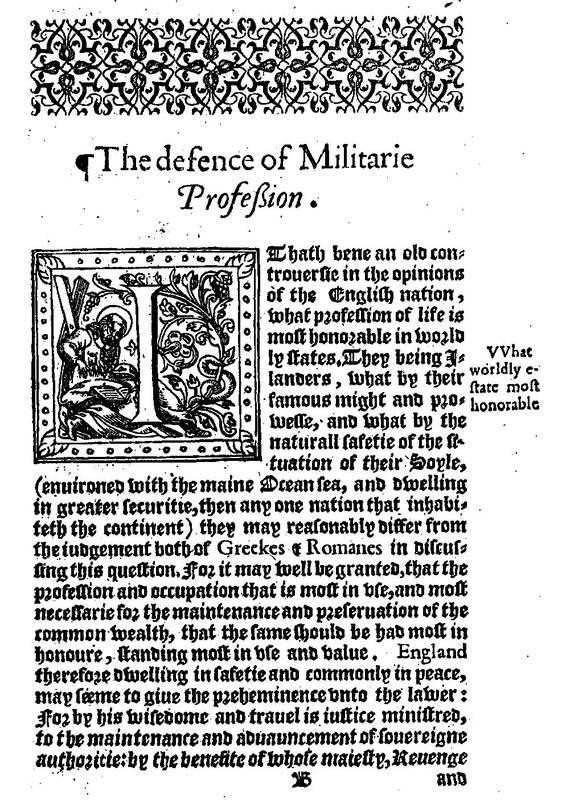 So Field gets involved but Harrison is there from the beginning and is commonly known as publisher of the 1594 Venus and 1594 Lucrece, with Field still printing. Where is Charlie Chan or Colombo? Sometimes I don’t know if to laugh or to cry at the shakespearean arguments. Did de Vere live where Golding’s books were on the shelves? Yes, surely. Could he take the Ovid’s translation from the shelf each day, could he discuss it with Golding as his uncle almost daily? That is did de Vere live, did he grow up, WHERE this spirit was and breathed? Yes. Well, it doesn’t matter. What REALLY matters that there were horses and carts and Shakspere COULD sit on a cart, and if he wanted, he could go to London to Field… Never ever any mention of such an occasion, but the victorious conclusion is ready: yeah, if he could, he surely did. There are tens of thousands of people who lived back then in London and Stratford, of course more than likely that whoever ever came across Field in the street, later popped up in his shop, just like Shaksper, why not? If they could, they did…How many books must have been on thes shelves of Field as a publisher, and Shakspere could read all…. and THEY laugh at Oxford grown up within reach of the Metamorphoses… Are they normal?